The following document is currently only available in French. Sorry for the inconvenience. 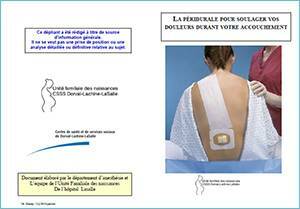 This document has been written the anesthesia department and the team of Unité Familiale des naissances de l’hôpital Lasalle for general information only. This document is not intended as, nor should it be construed as an opinion or a detailed analysis on the matter.